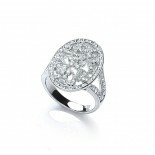 Add a sophisticated and stylish statement to any ensemble with this vintage inspired Buckley London ring. With floral accents and light catching hand cut crystals this elegant antique looking ring is sure to be a show stopper at any event. Matching earrings (E2065) and pendant (GN1026) also available.